Lord Horatio writes: “While stoking our giant bonfire with timber felled by high winds, I saw the light, so to speak. It dawned on me that some of the stouter branches could be used to make a treehouse or two for the grounds of The Hall. Boyhood memories of makeshift eyries blended seemlessly into visions of watching the sun go down, drink in hand, from the balcony of a dream chalet in the sky. Before tackling my “man in the know” Barry Walters, see his Gallery, I had a look at what is being whittled into shape around the world. Depending on your budget the choice is staggering. 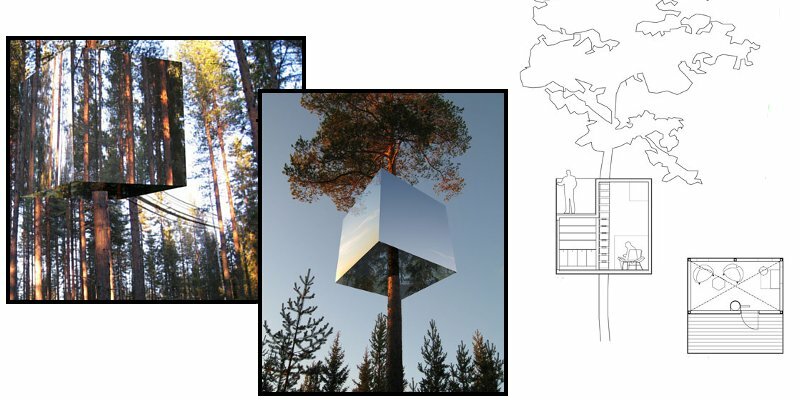 Top of my chart for innovation is the wonderful ‘Stealth’ mirror cube , wrapped round a tree in the heart of a Swedish forest. Despite weighing in at around five tons it reflects the surrounding woodland and thus, like a magician’s illusion, seems to disappear. Ah, I hear you say, what of the unsuspecting birds flitting from bough to bough? 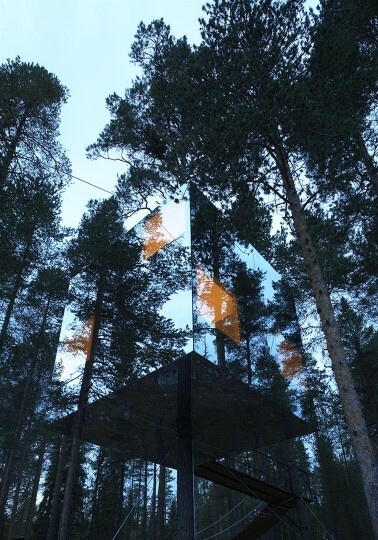 Well the clever folk at architects, Tham and Videgard have put transparent ultra-violet layers in the mirrors so the wildlife can ‘see’ the cube. 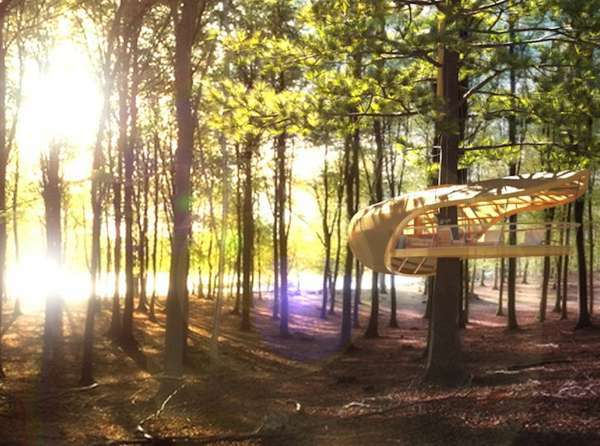 The invisible retreat is not the only big surprise commissioned by the visionaries at Treehotel. Among the trees in Harads, there is also a giant birds nest and a flying saucer to snuggle up in too. 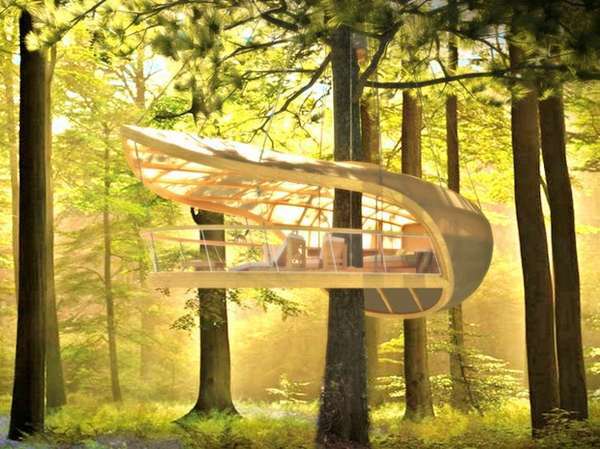 Do have a look at the treehotel. 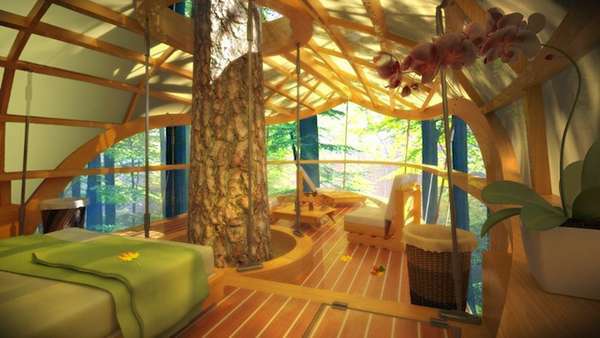 Other favourites are a series of lovely wooden structures based on winged maple seed pods and planned by architects Farrow Partnership for trees in the E’Terra Samara Resort, Tobermory, Ontario, Canada. They seem to float serenely on air. Magical!